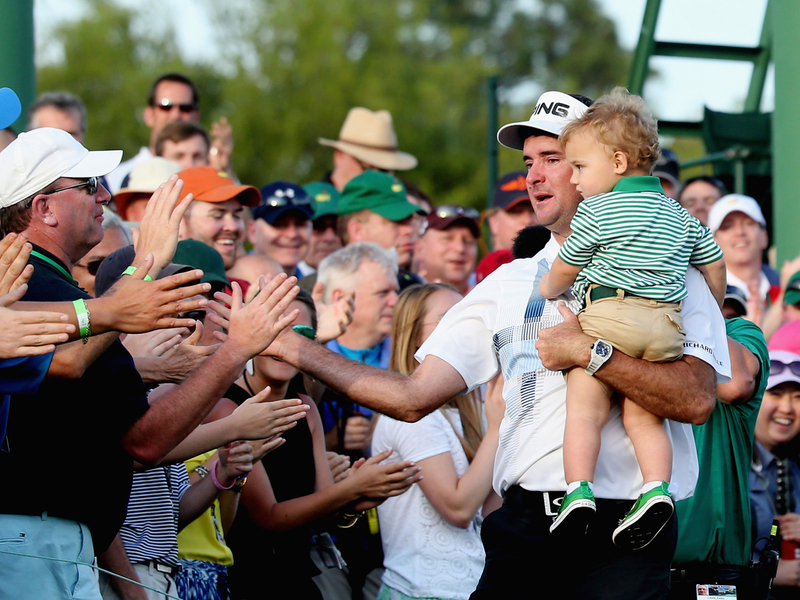 AUGUSTA, Ga. - Bubba Watson's second Masters title was nothing like the green jacket he won two years ago. The only daring shot Watson hit was one he really didn't need. The wild swing in momentum came on the front nine, not the back nine of Augusta National. And the sweetest difference of all Sunday was seeing his 2-year-old son walk toward him on the edge of the 18th green after his three-shot victory over Jordan Spieth. "This one's a lot different," Watson said. "The first one, for me, it was almost like I lucked into it." "After giving it away last year, I wanted it back," Watson said. "I told Adam we could just swap it back and forth every year." But he three-putted for bogey on No. 8 - the first 6 on his card all week - as Watson got up-and-down for birdie to tie for the lead. Spieth then made a rookie mistake, leaving his approach below the flagstick on No. 9 and watching it roll back into the fairway, setting up another bogey and two-shot swing. His tee shot on No. 12 found Rae's Creek. He missed a short birdie attempt on the 13th. "That was fun, but at the same time, it hurts right now," Spieth said. "I wanted to get in contention on the back nine Sunday, but didn't come out on top." This was nine holes of theater everyone expected out of Sunday at Augusta National - except it was the front nine. After trading pars on the opening hole, either Watson or Spieth - sometimes both - made birdie or bogey over the next nine holes. Two holes to close out the back nine changed everything. Amen Corner swung the Masters in Watson's favor for good. All he got was a par. Over the final hour, that's all he really needed.